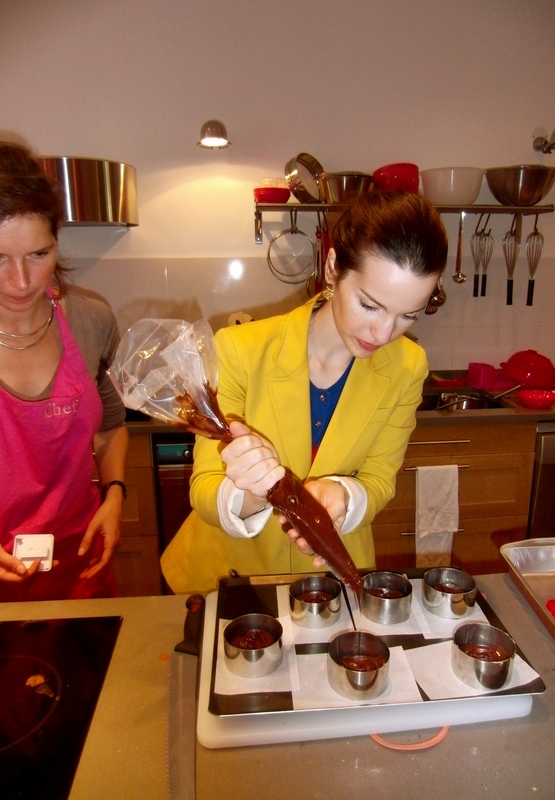 Another divine dessert made in Chef Noemie’s cooking school on Rue Nollet. 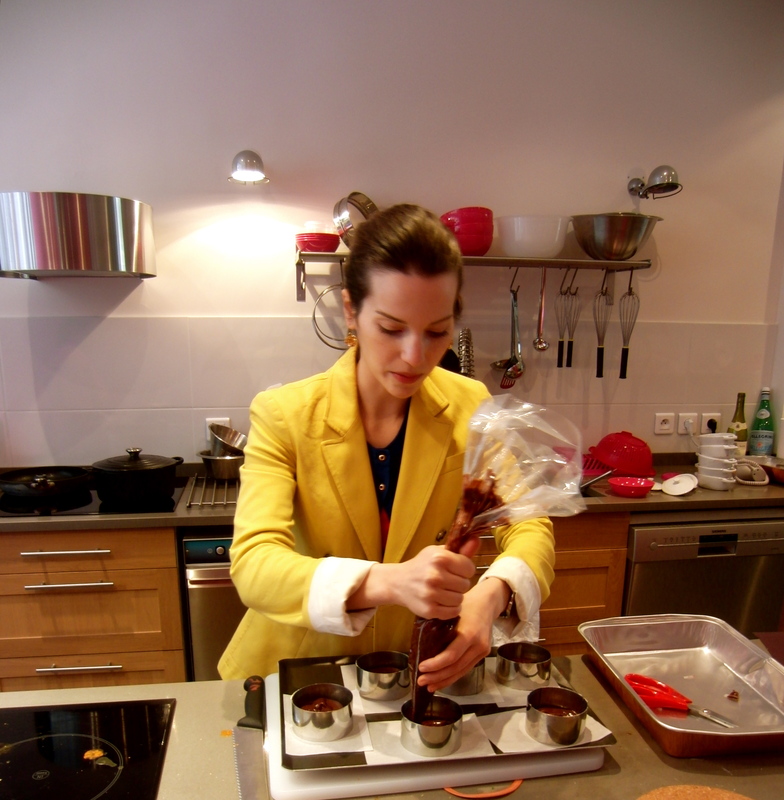 Humble Noemie shakes her head and laughs when I tell her she is the most masterful pastry chef I have ever known, drumming out incomparable desserts day after day in her pretty-in-pink professional kitchen. She indulges alongside us americains but has not one ounce of fat to show for it. Probably because she is so busy racing around the kitchen, cleaning up after us and making sure we don’t make actual lava cakes. 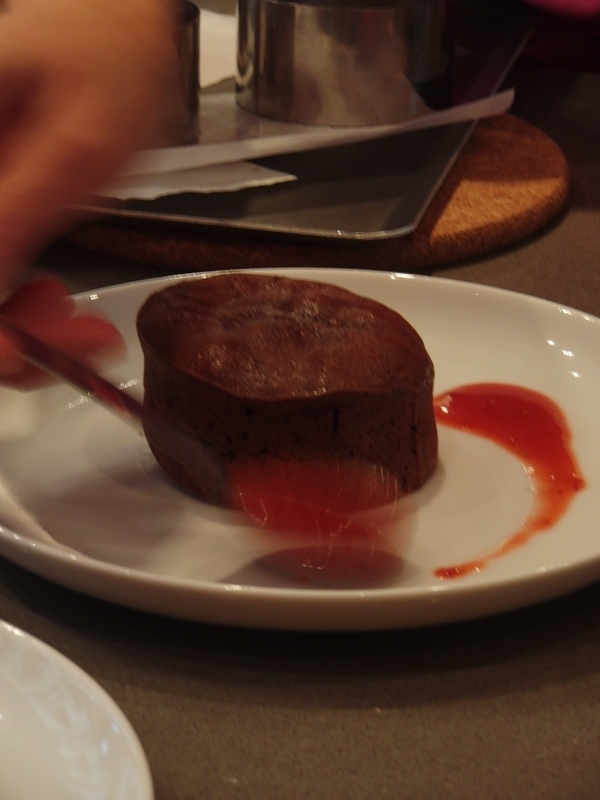 We sat at our bar stools and dined on our lava cakes as slowly as possible, dewy-eyed and chocolatey, and continued to shower Noemie with compliments. Her artistry, her flair, her delicious personality… she had created quite a business for herself. She demonstrated humility once again, suggesting that it was the position of the school (it is a storefront with glass windows) that enabled her to grow her business. Passersby took notice and grew intrigued as they watched her students chopping, dicing, and of course, eating. She felt she was good at the cooking, yes, but needed help marketing herself. We thought she should be written up in one of the glossy magazines. Oui, Noemie agreed, wouldn’t that be nice? We scraped our plates, getting every last bit of chocolate before we ended the day, and in walk two stylish Parisians. One tall, trendy woman and one gentleman with gorgeous French shoes and an expensive camera. Lots of French was exchanged. They apologized for interrupting, wished us a bon appetit and were on their way. Noemie smiled at us with cheeks as pink as her apron. Well? Who were they? Anne Jessica, a new mom in the neighborhood and our only Parisian participant in the class, translated for us. ‘They are from Marie Claire. They are writing an article about the neighborhood and want to feature Noemie.’ Voila! They were planning to return that afternoon to photograph her in her kitchen. 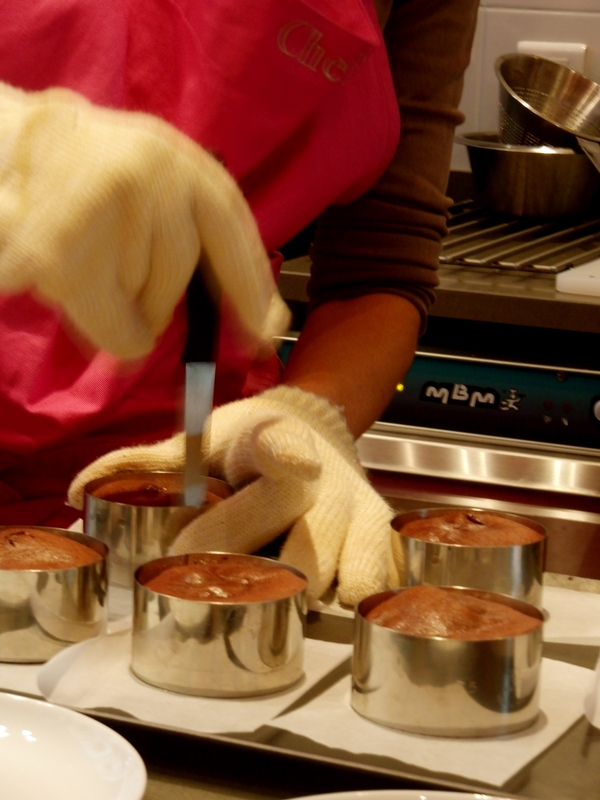 So Noemie popped two more lava cakes in the oven for her new friends at Marie Claire. 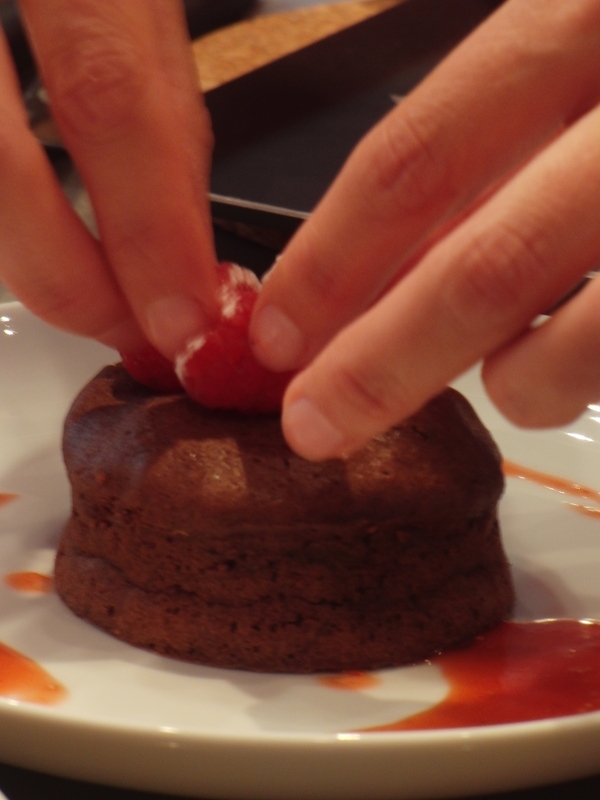 Les Secrets Gourmands de Noemie was always a posh destination for amateur chefs, but now it has truly been ‘discovered.’ We will all have to book far in advance for our next lava cake! 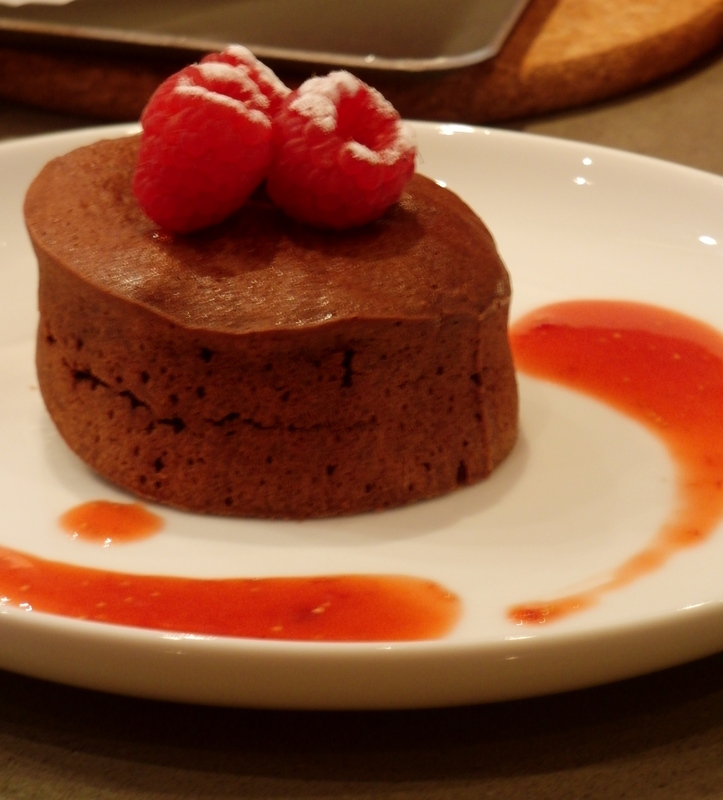 Recipe: Pre-heat the oven to 400 degrees F. Melt the chocolate and butter in a bowl over a bain marie. Put aside to cool. Whisk the eggs with the sugar until you get a mousse consistency. Add the salt and cold melted chocolate. Stir to combine. Sift the flour and add it to the mixture. Stir to incorporate. Let this rest in the fridge for 30 minutes. Butter and flour individual molds with a brush. Noemie taught us to always butter the molds with vertical strokes. Spoon the batter into the molds so that they are 3/4 full. Bake for 7 minutes at 340 degrees F. Unmold immediately and garnish with fresh berries and powdered sugar. Serve with a bit of raspberry sauce, crème anglaise, or a ginger syrup. 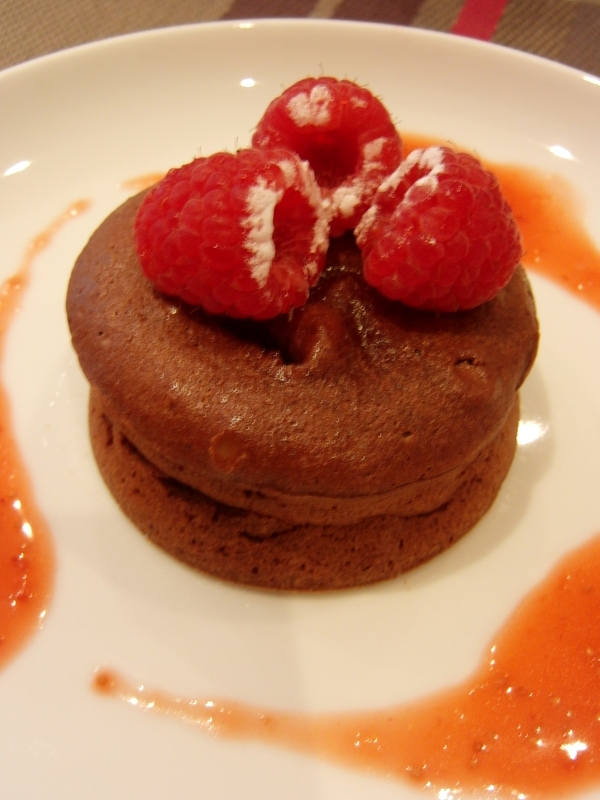 *Noemie’s tip: Freeze the chocolate batter in the baking molds and bake when needed.